Two hundred fourteen people attended our 9th annual convention in Nanaimo from March 14-16th. Participants took part in workshops on confined space entry, soils and getting conversant with SPM V3. Educational sessions on water reuse, changes in water use, high strength effluent, nitrogen management, rainwater harvesting and more were part of a comprehensive program for delegates. Thirty-two booths were hosted by our very supportive manufacturer and supplier stakeholders. 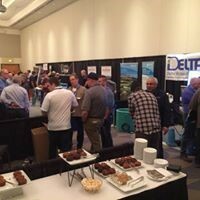 The trade show was a very busy place to be on Friday, March 15 and vendors provided a strong technical program for the delegates. Plans are already underway for next year’s event, which will be held in the Okanagan, so stay tuned for more information. You can view more photos from the convention here. WCOWMA-BC would like to thank EMCO and Waterloo Biofilter for sponsoring a Pub Night for convention delegates at the Lighthouse Bistro on Thursday, March 14, 2019. WCOWMA-BC would also like to thank Premier Plastics for their contributions to the entertainment at the banquet dinner on Friday, March 15, 2019.